As a half British family, it was pretty important to us that we find the perfect fish and chips (chunky fries) recipe. We’ve tried a few, and finally created this one from a blend of our favorites. We often cook it when we have guests around for dinner, because it is a guaranteed hit! 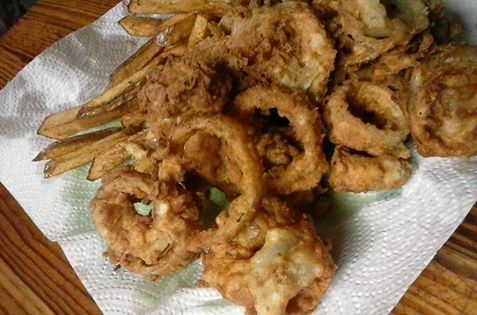 Because local fish, or even just not questionable fish, can be hard to source, we tend to use this with some local chicken, and whip up a side of home-grown onion rings with it too. It is quick, simple, and delicious, and all made from local ingredients. We even fry in lard from local pigs, like the ones we raise ourselves. A whole lot better than a fast food meal in every way! You can use this on anything you like battered: fish, onion rings, chicken, chocolate bars… You will need two bowls, a dry bowl and a wet bowl. The recipe gets its name because you first dip the food to be battered into the dry bowl, then into the wet bowl, and then back into the dry bowl again, before frying. This recipe couldn’t be simpler to make and is so delicious, you’ll never believe you did it at home. You can fry it quite dark before it begins to taste overcooked, so don’t worry if your chicken takes more than a few minutes to cook. You will want to batter whatever you are cooking when raw. We tend to use whole wheat for our flour; a great chance to be a little healthier without complaints from those used to the bleached white stuff. Just because it’s deep fried, doesn’t mean it can’t still be ethical food.